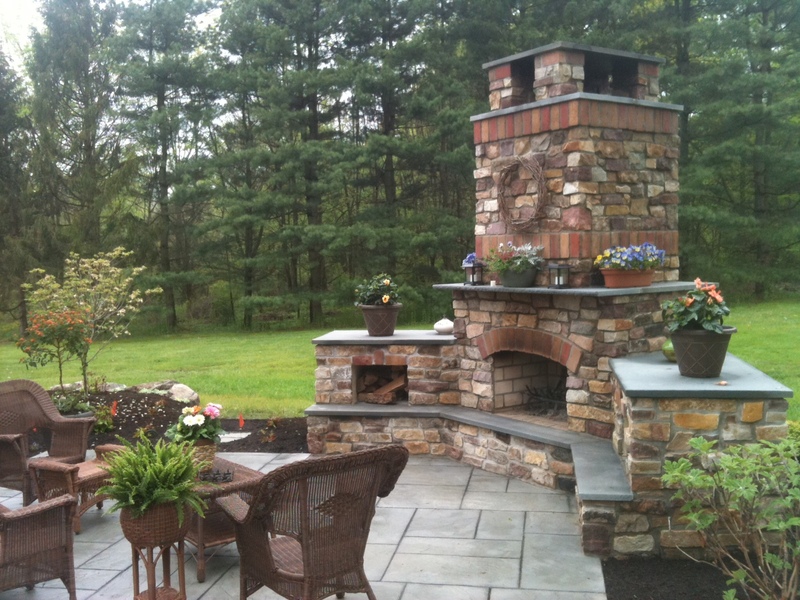 Make yourself comfortable around a well-designed and well-built custom outdoor fireplace by the Earthscape Company. Outdoor fireplaces are growing in popularity with the outdoor living craze featured in many Home and Garden. Magazines and web-publishers frequently post beautiful photos of large stone fireplaces and homeowners are now demanding fire places, not just fire pits in their outdoor living rooms. There is a calm tranquil ambiance that surrounds an outdoor fireplace. The light and glow of the fire invites guests to sit down, relax and have peace of mind. Proper design features for outdoor fireplaces encourage conversation and sooths the soul. Design and installation of these popular features can be very technical and it is important to educate yourself on the proper construction techniques beforehand to avoid costly mistakes. That is why it is important to choose The Earthscape Company to design and build your new outdoor living space today.